With the ever increasing spatial resolution in the characterization of microstructures, textures and chemical as well as isotopic patterns and the continuously improving sensitivity and precision in mineral chemical and isotopic analysis, increasing evidence has emerged indicating that phase relations in rocks from high-temperature environments may be modified during exhumation and cooling and that the original equilibrium phase relations may not have been preserved or that equilibrium may never have been attained fully even at high temperatures. Such situations are indicated by the chemical zoning of minerals, non-equilibrium element partitioning, and by reaction microstructures comprising reactant and product phases in specific geometric arrangements such as in corona microstructures. The isotopic and chemical patterns and reaction microstructures observed in minerals and rocks reflect the processes involved in their genesis. The mechanisms of chemical mass transport, the breaking and making of chemical bonds at reaction interfaces, nucleation and interface migration and the coupling among these processes determine the microstructures, textures and isotopic and chemical patterns of minerals and rocks. If the associated kinetics is understood, this allows the dynamics of crystallization, including the evolution of the physical and chemical conditions, to be reconstructed. This provides crucial information complementing the insights that may be obtained from the thermodynamic analysis of phase equilibria and from radiometric age dating. This volume accompanies an EMU School that is meant to bring contemporary research on mineral reaction kinetics to the attention of young researchers and to put it into the context of recent developments in related disciplines. The school and the accompanying volume cannot give a comprehensive review of the current state of geomaterials research. Rather a selection of topics, methods and concepts, which the contributors deem currently most relevant and instructive, is presented. The aim is to provide a methodologically sound insight into the theoretical foundations of mineral reaction kinetics, to help students to become acquainted with contemporary methods in experimentation and analytical techniques, and to give worked examples that illustrate recent advances in geoscience based on an improved characterization and understanding of mineral and rock systems. The volume addresses three broad topical fields. In the first part recent developments in mineralogical and petrological experimentation and instrumental analyses are reviewed. In particular, scanning and transmission electron microscopy, secondary ion mass spectrometry and synchrotron-based material characterization are addressed. In addition, theoretical approaches including selected topics in irreversible thermodynamics and atomistic modeling are presented. In the second part the processes underlying mineral reactions, including diffusion, interfaces and interface motion as well as nucleation and growth, are investigated and put into the context of geomaterials. Both theoretical foundations and geoscience applications are discussed. The third part is devoted to specific fields in geomaterials research. Knowledge from experimentation, theory and modelling is integrated with contemporary analytics to address problems in different fields of geological and planetary research. The various aspects addressed include crystallization from the melt, reactions of minerals with aqueous fluids, metamorphic mineral reactions, crystal orientation relations, reaction induced deformation and chemical-mechanical feedback, as well as the links between mineral reaction and (isotope) geochemical signatures. 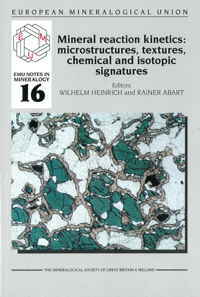 This volume emerged from the joint initiative of an international team of researchers with their backgrounds in mineralogy, petrology, geochemistry, geology, materials science, physics and chemistry, who were brought together through the fascinating topic of geomaterials research as their common denominator. We thank all the contributors for their enthusiasm and for the effort they spent on writing great contributions. We do hope that the choice of topics and presentations collected in this volume will be received well in the community and in particular by the scientists of the young generation. With this volume we intend to strengthen the links among a range of diverse research directions and to stimulate new thoughts and initiatives in geomaterials research that can improve our understanding of how Earth and other planets work. (2017) xv + 651 pp. ISBN 978-0903056-63-2.